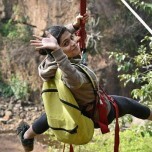 Get the thrilling experience of trekking and rappelling in the valley of shadows, the Sandhan Valley, with an easy, overnight itinerary from Pune. At the base village of Samrad, after learning how to pitch tents, you'll rest and enjoy the star-studded night with your fellow campers. The next morning, you'll begin the trek and go valley crossing over mountain tops and rappelling down the 80 feet tall cliffs at Sandhan Valley. Not too strenuous, this trek is perfect for those who are looking for an off-beat adventure on a short itinerary. Located in the Sahyadri hills, the Sandhan Valley descends as deep as 200 feet between two mountain walls, stretching almost 2 kms in length. 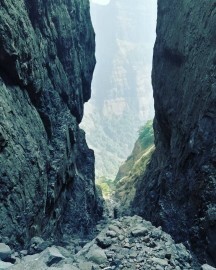 One of the largest canyons in Maharashtra, this water-carved valley, near the Bhandardara lake, is located in the Kalsubai Harishchandragad Wildlife Sanctuary. 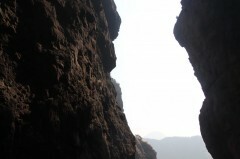 The valley is also known as the valley of shadows since the two towering mountain cliffs on either side of the valley block the sunlight from reaching the ground in several sections. • Go trekking in Sandhan Valley, the valley of shadows. • Enjoy a night of camping and stargazing at the base village. 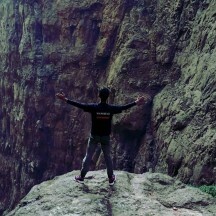 • Go rappelling down the 80 feet tall mountain wall of Sandhan Valley. • Explore trails and routes in the Kalsubai Harishchandragad Wildlife Sanctuary. Travellers are required to follow instructions of the camp leader during the trip. For cancellations made more than 12 hours before departure of the Sandhan Valley trekking and rappelling trip: 70% refund. 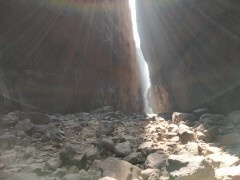 For cancellations made less than 12 hours before departure of the Sandhan Valley trekking and rappelling trip: no refund. You're expected to carry your own blankets for use during overnight stay in tents. You'll be picked-up by 20:00 hrs from The Travel Café in Pune, and dropped-off by 22:00 hrs at The Travel Café in Pune. Timings are subject to change and may be delayed. The tour operator takes utmost care to ensure the safety of travellers and shall not be held responsible for any accident, mishap or loss of life and property during the trip. Report at The Travel Café in Pune by 20:00 hrs. Here, you'll meet your fellow trekkers and board a bus that'll take you to the village of Samrad, the start point of the trek. You'll arrive at Samrad after a 6-hr drive. Overnight in transit. Pitch your tents and rest for the night at the base village. At the base village, you can help with setting up the campsite and pitching tents. 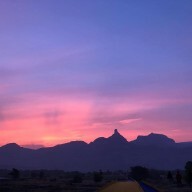 After a few hours of camping games and stargazing with your fellow trekkers, you'll drift off into sleep in your tents. In the morning, you'll have breakfast and begin trekking from the campsite. A short trek later, you'll arrive at the rappelling spot, where you'll set up ropes and go rappelling down 80 feet in the valley. You'll also get to participate in valley crossing during the trek. While crossing the valley, you'll also wade across waist-deep water. 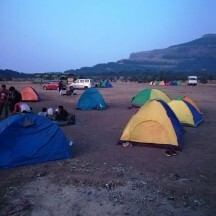 After completing the trek by late afternoon, you'll board the bus and travel back to Pune. Subject to traffic conditions, you'll be back in Pune by 22:00 hrs. 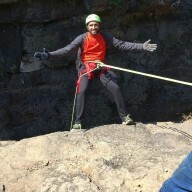 Go rappelling down the cliff at Sandhan Valley. Personal expenses like apparel, gear, extra meals or beverages etc. Costs due to unforeseen circumstances such as bad weather, road blocks etc. You'll be accommodated in tents at Samrad village. Please carry your own blankets for use during overnight stay in tents. Since no meals are included in today's package, you're requested to have dinner before reporting to the pick-up point. Your trip ends by 22:00 hrs. Today's meal package includes breakfast and lunch. Subject to traffic conditions, you'll be back in Pune by 22:00 hrs. The Travel Cafe is a popular landmark in Pune accessible via private cabs/taxis. It is located on the Senapati Bapat Road, near J. W. Marriott hotel. The tour operator will arrange your transport to the start point of the Sandhan Valley trek.